In this article, we shall discuss few methods with the help of which you can import Exchange Database EDB file into Exchange online or Office 365. This becomes all the more important as presently more and more organizations are finding it rather cost efficient to switch to Office 365, so that they no longer have to worry about any of the infrastructure maintenance costs of running an on premises deployment. System failure caused hardware malfunction etc. Now that we have understood what are some of the common problems that can affect the EDB file, let’s move onto how we will import EDB file to Office 365. This is two-step process, first you will have to Convert the EDB file to PST file and then import the resultant PST file into Office 365. Here mailbox name refers to the specific name of the mailbox that you wish to export to PST file. Whereas location of output file refers to the location path of resultant PST file. For example, the above shown cmdlet will export the mailbox named Admin03 to a .PST file, in a shared folder ‘PSTFile’ on server 03. If you are wary of using the aforementioned powershell cmdlets, you could always use the Exchange Admin Centre (or EAC) to export EDB mailboxes to PST file. Open EAC and go to Recipients > Mailboxes > More options and choose ‘Export to a PST file’ option. Now the ‘export to .PST file’ wizard will open and you can follow the instructions within to complete PST export of mailbox of your choice. Goto your Office 365 Admin center > setup (side bar) > Data Migration and Select ‘Upload PST files’ option as shown below. Network upload method: In this, method you can bulk import all the PST files you need to Office 365 using Azure Azcopy tool. However, you need to ensure that you have ‘Mailbox Import Export role’ assigned so as to be able to import PST to Office 365. For more information, check here. Drive shipping method: In this scenario, you are required to ship the hard disks containing your organization’s data in form of PST files physically to Microsoft to import PST to Office 365. Upon receiving the disks, the data from hard disk will be copied to cloud by members of Microsoft’s team. Once the PST files are uploaded to a storage area on the cloud, you can start import jobs, with various filters, to import exactly what you need into target user mailboxes. Visit here, for more information about drive shipping. As should be evident by now, trying to import EDB to Office 365 is a multi-step process that can get quote tricky especially when there are a large number of mailboxes involved. Things can also get more complicated if your EDB file is corrupted by some means, as this will put all the information stored within it at grave risk. 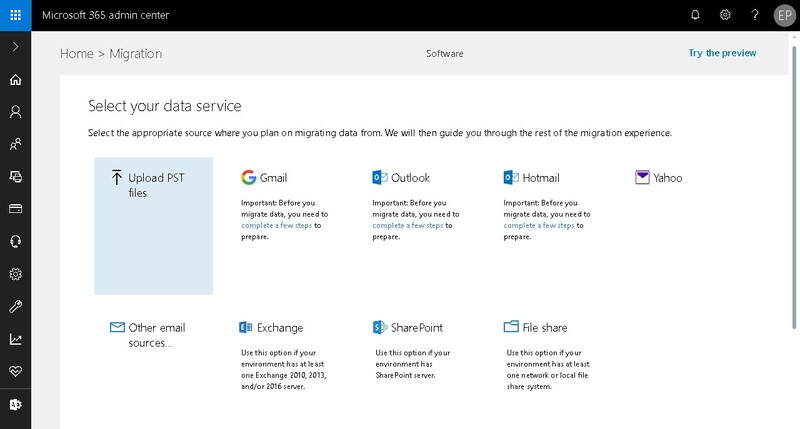 This is where a professional third party tool like the EdbMails exchange EDB to Office 365 migration tool can help you directly migrate all your EDB mailboxes to Office 365 tenant. Recover corrupt EDB file data and securely migrate it to target Office 365 server with an intuitive interface that is both easy to setup and use.